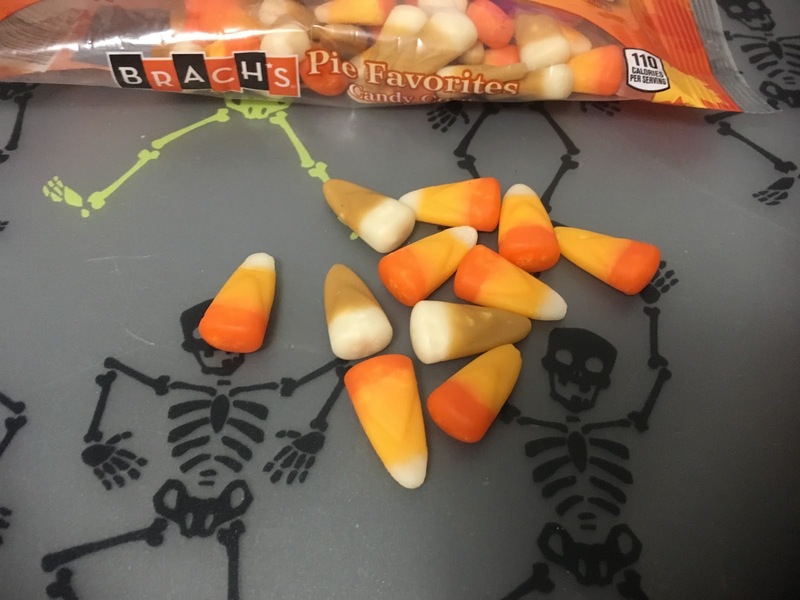 It's no secret that Brach's Candy Corn isn't my favorite sweet snack. It's not even my 10th favorite candy. But I have a morbid sense of curiosity, and I'm a stickler for tradition. I don't want to be the one to anger the Halloween spirits because I refused to shovel sweet pieces of carnauba wax into my face. These aren't exactly new flavors, but I think this is the first time they've been packaged together like this. And what a beautiful package it is. Past designs have been rather generic, opting to show off the real world food their candies are emulation. This year, they still have a picture of the flavor inspirations, but they've given the whole bag a Fall makeover. Most of the package is a shade of burnt orange, and it's dotted with various leaf designs. They should add a disclaimer: "Each bag full of cool autumn breezes". 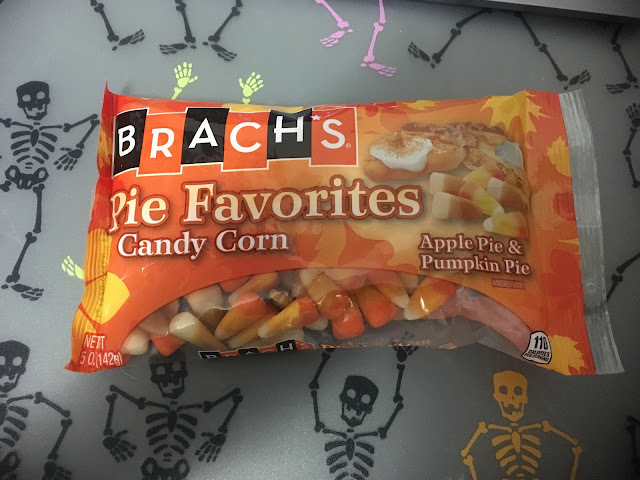 Brach's candy corn has never been very aromatic, and the Pie Favorites certainly continue that trend. Opening the bag and taking a whiff, I'm reminded of cheap fall scented candles, like those multi layered ones you find at Dollar General. The other issue I have with candy corn is the texture. The feel reminds me of a dried out candle, like Brach's has been raiding Yankee Candle's reject pile. As for the flavor, I was rather surprised by the Pie Favorites. Thankfully, they taste a lot better than they smell. First up was the pumpkin pie flavor. It's the orange, yellow, and white pieces in the pic up there. My first bite worried me a bit, since it had the same waxy flavor and texture as all the other varieties I've tried. As I ate them though, they ended up just as sweet as always, but with a bit of spiciness. It definitely helps to savor them a bit, to let them melt down some, rather than just chewing the pieces up and swallowing them. I'm shocked to say that I liked them, something I'm not sure I've said with any candy corn flavor. The pumpkin pie candy corn was pretty good, but the apple pie was downright delicious. The same rules apply, you should take your time enjoying them, but be prepared to be rewarded with so much more flavor. I was reminded of baked apples, with a bit of cinnamon and hint of citrus. It sounds crazy, but I think I finally found a flavor of candy corn that I like enough to buy another bag. I'm also convinced that given enough of a push, apple pie could take pumpkin spice's place as the Fall flavor of choice. I'm not sure how it would taste as a coffee, but I'm willing to give it a shot. So, whether or not you're a fan of candy corn, you should give the Pie Favorites a shot. You might just be surprised by how much you like them. If you don't, you can just send me the leftovers. Second: This sounds pretty good. I've enjoyed these in the past but getting bother together? That's a huge victory. I love candy corn. The waxier the better! I must have loved candy corn at some point, but it was probably a very short window of time. Now I mostly just tolerate it. These flavors though, I'd gladly pick up another bag the next time I see them.